The scholarly use and understanding of the word apocalypticism has varied much in the history of research on these topics. The different words associated with apocalypticism each possess their own subtle connotations. The specific term, apocalypticism, and the many forms associated with it are derived from the first Greek word in the book of Revelation, apokalypsis (revelation). The noun apocalypse refers to the revelatory text itself. The particular worldview found within an apocalypse and the assumptions that it holds about matters concerning the “end times” is referred to as “apocalyptic eschatology. ” The noun apocalypticism refers broadly to the historical and social context of that worldview. 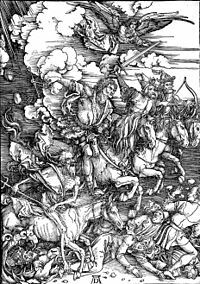 When scholars use the word apocalyptic, they typically assume a distinction between the ancient worldview and the body of literature associated with it. to a diverse body of literature generally dating from the time of the Babylonian exile down to the Roman persecutions. Characteristic elements of this literature include a revelation of heavenly secrets to a privileged intermediary and the periodization of history. In these texts the eschatological perspective of the text reinforces the expectation that the era of the author will reach its end very soon. This apocalyptic eschatology suggests that the historical setting of these writings is one of crisis and extreme suffering. Scholars who work in the area of ancient Jewish and Christian apocalypticism are aware that Jewish apocalyptic literature survived due to ancient Christian appropriation and interest in it. This is because Jewish apocalypticism and the literature associated with it were generally viewed unfavorably by later forms of rabbinic Judaism after the destruction of the Second Temple. The lack of a developed Jewish interpretive framework for these texts accounts for part of the scholarly problem in determining the precise origins and influences of this phenomenon. Many historical questions about the social context and the use of these Jewish apocalyptic writings in ancient Jewish communities remain unclear and largely theoretical. What is certain is that Christian communities were responsible for the preservation and transmission of these writings, and they appropriated the worldview and the literary forms of Jewish apocalypticism. Scholars have long sought to identify the origins of Jewish apocalypticism with little consensus. Many have presumed that Jewish apocalyptic eschatology grew out of earlier biblical forms of prophetic eschatology. Other scholars have proposed a Near Eastern Mesopotamian influence on Jewish apocalypticism. While there is no clear trajectory from Mesopotamian traditions to Jewish apocalyptic, and admittedly no Mesopotamian apocalypses exist, there exist some striking resemblances between the two. Some shared characteristics include an emphasis on the interpretation of mysterious signs and on predestination. The motifs of otherworldly journeys and dreams are also prominent in both Mesopotamian traditions and Jewish apocalypticism. Other scholars have observed a Persian influence upon Jewish apocalypticism. Present in both is the struggle between light and darkness (good and evil) and the periodization of history. Identifying the relationship between Jewish apocalypticism and other traditions has been complex because some of these elements (e.g., otherworldly journeys and revelatory visions) become common to the GrecoRoman world as well. While early Jewish apocalyptic was rooted in biblical prophecy, later forms of apocalypticism from the Greek period have more in common with wisdom literature. Scholars often make a distinction between the general phenomenon of apocalypticism and the literary genre of “apocalypse.” A group of scholars led by J. J. Collins formulated the following frequently cited definition of the literary genre of apocalypse in 1979: “‘Apocalypse’ is a genre of revelatory literature with a narrative framework, in which a revelation is mediated by an otherworldly being to a human recipient, disclosing a transcendent reality which is both temporal, insofar as it envisages eschatological salvation, and spatial, insofar as it involves another, supernatural world.” Texts associated with apocalypticism are characterized by an understanding that salvation from a hostile world de- pends on the disclosure of divine secrets. The only example of an apocalypse from the Hebrew Bible is the book of Daniel. Other well known examples of apocalypses include the writings of Enoch and Jubilees and the traditions associated with them, 4 Ezra, 2 Baruch, 3 Baruch, and Apocalypse of Abraham. Some texts from Qumran and the Dead Sea Scrolls present a worldview that is properly described as apocalyptic but do not qualify as examples of the literary genre (e.g., “Instruction on the Two Spirits” from the Community Rule text and the War Scroll). The last book in the New Testament, known as the Apocalypse of John, is an example of a Christian apocalypse. The canonicity of this book was not accepted at first in the East. The book is a record of the visions of John while he was exiled on the island of Patmos and possesses a prophetic authority among Christian communities throughout history. Highly symbolic language, the presumption of a cataclysmic battle, and the disclosure of heavenly secrets to a privileged intermediary make this text a classic example of the genre. Other examples of Christian apocalypse outside the Bible include the Ascension of Isaiah and the Apocalypse of Paul.